Chase Utley tied Boog Powell’s record on Wednesday for most consecutive postseason games reaching base. Utley walked in the first inning of the Phillies’ NLCS clinching 10-4 victory over the Dodgers to reach base for the 25th consecutive playoff game, equaling the record Powell held alone for 38 years. Boog established the original mark before there was even a League Championship Series much less a Division Series. The streak began on Oct. 5, 1966. Powell recorded hits in each of the four games of the World Series including a 2-for-3 effort with a run scored and an RBI in Game 2. The starter that day was Sandy Koufax, the first pitcher to record four no-hitters, one of which was a perfect game in 1965. 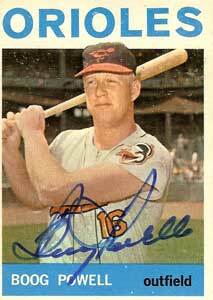 Powell continued reaching base through three games of the 1969 American League Championship Series (the first-ever LCS after the American League split into East and West divisions), five games of the 1969 World Series, three games of the 1970 ALCS, five games of the 1970 World Series, three games of the 1971 ALCS, and two games of the 1971 World Series. The streak ended on Oct. 12, 1971, when he went 0-for-5 with a strikeout in a 5-1 loss to the Pirates in Game 3 of the World Series. Pittsburgh starter Steve Blass held almost the entire Orioles lineup in check with a complete-game, three-hit effort during which he struck out eight, walked two, and allowed one earned run. Frank Robinson accounted for two of the O’s three hits on the day, including a solo homer leading off the seventh inning. Given Powell’s accomplishment it’s ironic that he compiled a career .324 postseason on-base percentage, well below his career .361 mark. Utley’s postseason OBP currently stands at .398; his career mark is .371.